Today’s AM fix was USD 1,295.75, EUR 944.15 and GBP 779.68 per ounce. Yesterday’s AM fix was USD 1,295.00, EUR 942.09 and GBP 779.14 per ounce. Gold fell $8.50 or 0.65% yesterday to $1,292.50/oz. Silver remained unchanged at $19.75/oz. Snapping its four-day losing streak, gold prices recovered very marginally today. Traders said there was a revival of buying by retailers at these lower levels and this contributed to a marginal recovery in gold prices. Gold in Singapore, which normally sets price in the important Indian gold market, rose 0.4% to $1,296.80 an ounce and silver by 0.8% to $19.86 an ounce. Among other precious metals, palladium gained nearly 1% today to $765/oz but is lower for the week. Gold remains near six week lows and is on track for a second straight weekly decline. Gold has dropped about $100 an ounce from a six-month high in the last nine trading sessions despite increasing concerns about the U.S. and global economy. There remain concerns that the manipulation of gold prices being investigated by the FSA and Bafin may be ongoing and a factor in recent price weakness. Gold’s technical position is now negative and the close below $1,300/oz yesterday opens up the possibility of further falls to $1,270/oz and $1,200/oz. The sharp drop in prices in the last few days should bring physical buyers back into the market and support gold. Demand for gold in Japan surged 500% in the last month as Japanese buyers bought ahead of a sales tax increase and due to concerns about Abenomics and the ongoing debasement of the yen. A man who has been a trader for 33 years and works at a foreign-owned brokerage told the Financial Times that the tax increase represented a “good opportunity” to buy more gold as he was worried about holding too many yen-denominated assets. “I plan to hold it for a long time until there is a good time to sell, when the yen collapses or something,” he said. The aftershock of the stress tests was felt beyond U.S. shores for the first time. The U.S. subsidiaries of Royal Bank of Scotland, Santander and HSBC all failed on “qualitative” grounds, which includes failing to project losses rigorously when contemplating a severe recession or market meltdown. The Fed said that the banks management practices or capital cushions are not robust enough to withstand a severe economic downturn. Not surprisingly, the banks themselves accused the stress tests as being “opaque”. Twenty five other banks took part in the Fed’s annual "stress test" and received a green light for their planned dividend payouts and share repurchases. Bank of America and Goldman Sachs initially fell short of minimum capital requirements. However, they met the standards after reducing their planned dividend payments and share buybacks over the past week. The banks now have 90 days to address the weaknesses and risks identified by the Fed and resubmit their dividend and share buyback plans. 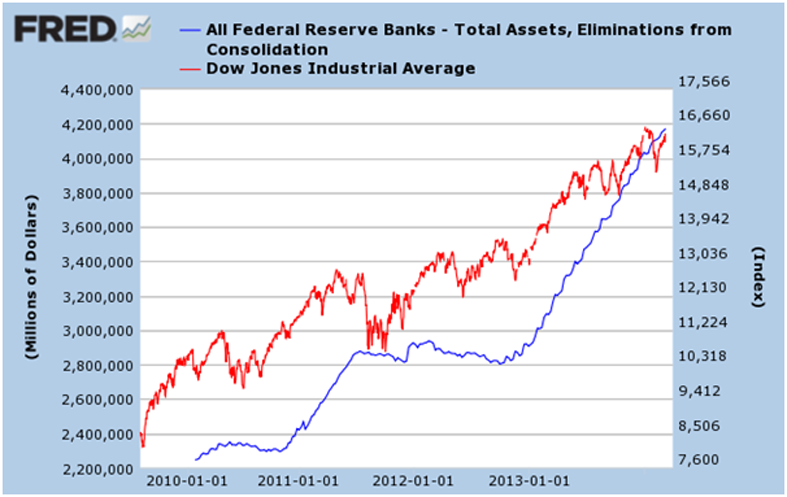 The Fed’s decision was part of the annual checkup it requires of banks with more than $50 billion in assets. Banks must now undergo tests to ensure they can endure shocks like those that upended the banking system and led to the massive government bailouts in the 2008 financial crisis. In what the Fed sees as the extreme scenario, the test assumed a rise in the 6.7% unemployment rate to 11.2%, a 50% drop in stock prices and a decline in home prices to 2001 levels. All of which appear a strong possibility given debt burdened state of the tapped out U.S. consumer and the poor fundamentals of the U.S. economy. Indeed real levels of unemployment in the U.S. are likely well over 11% already. It is important to note that if the Federal Reserve’s assets were marked to market, it itself is insolvent. The Fed’s balance sheet has ballooned to $4.3 trillion from $800 million in the past five years as the central bank has electronically created trillions of dollars in order to buy their own government bonds and mortgage-related bonds in a radical and indeed reckless attempt to kick the can down the road and prevent a systemic event or a recession or depression. The Federal Reserve is likely to suffer significant losses on its Treasury holdings once interest rates rise from historic lows. Indeed, the researchers at the San Francisco Fed have recently called for "stress tests" on the Fed itself and it’s assets and income, an echo of the central bank’s annual exercise for the nation’s largest banks.